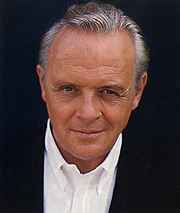 Sir Anthony Hopkins Evokes A Quintessentially American Tragedy As Oliver Stone's "Nixon"
I was living in South London. It was a month before I was due to come to America to New York to star in a play called `Equus.'" Actor Anthony Hopkins is recalling the year 1974, when his career and his life were to change dramatically with his move to the United States. But the landscape of that United States was changing even more dramatically right before his eyes, with history's first-ever resignation of an American president: Richard Milhous Nixon. "I remember watching on television very closely Nixon's farewell to the White House staff," Hopkins says. "I'd watched the resignation speech the night before, and I'm watching the farewell to the White House staff and I am quite overwhelmed by it. I thought, `God, what a tragedy this is.'" "After Gerald Ford announced the pardon a month later, I flew to New York. And the oddest thing is that the whole Watergate affair became very much a part of my life then. I was at the start of an American career, there was the excitement of going to New York to be in a [Broadway] play and the dream of going to America and working in America and possibly living there. It was a complete change of life for me, it really was. I look at 1974 as one of the turning points in my life." When the native of Port Talbot, South Wales, arrived in the Big Apple, he began preparing for the acclaimed theatre production that would cement his stateside reputation. Nixon memorabilia seemed to be everywhere -- a plethora of Nixon masks in stores, a second-hand car salesman doing a Nixon riff to hawk autos. "To actually end up playing Nixon 20 years later," says Hopkins with the usual British understatement, "is the oddest odyssey." Conspiracies. Cover-ups. Blind ambition. Even a little nobility." Those are the words with which one newspaper article describes the story that Oliver Stone's "Nixon" seeks to tell. But those words could also describe the story behind the making of "Nixon" -- a story that almost led to its unmaking. As recently as last February, Stone and his financing partner, Arnon Milchan's Warner-based New Regency, were squabbling over "Nixon." Stone reportedly wanted a budget larger than the proposed $35 million, and New Regency -- having expended substantial sums on two no-go Stone projects, "Evita" and "Noriega" -- was balking. By month's end, Stone and Milchan -- who had worked together exclusively since 1991's "JFK" -- ended their ties (except for pre-existing projects, including the potential Tom Cruise feature "A Bright, Shining Lie"). Meanwhile, Stone began receiving "Nixon" bids backed by 20th Century Fox, Cinergi Productions and Turner Pictures. On February 28 Stone announced that Cinergi -- with a $12 million assist from its distribution partner, Disney's Hollywood Pictures -- would back his $42 million production bill. Barely two weeks passed before more brouhaha bubbled. On March 20, Time Magazine published what it termed an expose based on the working script for "Nixon." Stone's film stood accused of proposing that a team of conspirators (CIA agents, Cubans, Mobsters and right-wing businessmen) killed John F. Kennedy, and that Nixon was aware of the plot. Other publications piled on: Newsweek characterized Stone's Nixon as a "pill-popping, Scotch-swilling, epithet-spewing" president who was "a misunderstood, but largely innocent victim of evil forces." Negative response even came from Hopkins' home town: the London Times (headline: "Nixon Film `Fantasy' Outrages Historians") weighed in with commentary from Nixon biographer Herbert Parmet calling the script "absolute, total and utter nonsense." Still at work with co-scripters Stephen J. Rivele and Christopher Wilkinson, Stone in April wrote to Time, saying the controversy "totally misrepresents the film we are trying to make.... I do question the fairness of taking an early draft of a script that won't even begin shooting for another month and putting your own very twisted spin on it." "Somebody got hold of the script and decided to blow it all out of proportion," Hopkins says now. "Implying that Nixon was involved in the assassination even the original script didn't say that. There is a scene in it where [key Nixon aides Bob] Haldeman and [John] Erlichman say that when they'd mention Cuba, [Nixon] would go ashen. "But Nixon himself expressed deep shock at Kennedy's death. Nixon didn't like Kennedy, that was pretty plain, because Kennedy beat him by a narrow margin in the 1960 election, and I think Nixon was always paranoid about the Kennedys and the handsome young men and how he was such a klutz himself. But no -- in fact, there's a long scene in which I say, `God, this is awful.' That it was a terrible thing. Nixon was suitably, deeply shocked by the assassination. As I think everyone was." When Hopkins accepted the role, "I was anxious about it," he says. In part, this was because Hopkins is British and Nixon was quintessentially American. But Hopkins was even more intimidated by Nixon's status as an icon and his paradoxical nature -- a complex, secretive man whose public persona roused adoration and ire. Onstage, Hopkins had already played the likes of Caesar, Claudius, Macbeth, Lear and Othello, and this would be his 35th film in a 35-year acting career. But nothing seemed like useful preparation for Nixon. "Either I could just take the risk," he remembers thinking, "or I could take some time off, do a nice safe play somewhere, have a nice safe career for the rest of my life, and then live to regret it forever." Over a breakfast of kippers with Stone in London, Hopkins opted for danger. In recreating Nixon, Hopkins sought to illuminate both sides of Nixon's complex character. It's a task to which Hopkins is perhaps uniquely suited. His previous performances run the gamut, from gentle Christian professor C.S. Lewis in 1993's "Shadowlands" to Hannibal Lector, the cannibalistic serial killer in 1991's "Silence of the Lambs" -- the role for which Hopkins won his Best Actor Oscar. Hopkins himself believes that every character has the same human core: when asked by a producer of his 1980 CBS telefilm "The Bunker" to play Hitler in a way "less human," Hopkins is reported to have replied, "Well, Hitler is human. That's what's frightening." "I think Nixon was a deeply flawed man, Hopkins says. I can understand why he did what he did -- to a point. But I know that we're all flawed. What I think is the height of hypocrisy is when someone stands up and says [of Nixon], `Oh, he's one of the evil people -- he's definitely a bad person.' Or, `He's a good man but did bad.' We're all capable of all kinds of dark behavior, every single one of us. We don't know what we'd do in the situation. Nixon's main problem was that he was a man who was deeply divided in himself, a man who was probably riddled with self-hate and never felt worthy. "But who am I to know?" Hopkins adds, challenging even himself. "I know that members of his family revered him, thought he was a lovely man. And the people who worked with him in recent years thought he was a terrific guy. Everyone is so complicated, every man on earth. It's not black or white." Nixon" follows the Yorba Linda, Calif. native from his lower-class childhood, through poverty-stricken student days at Whittier College and Duke University School of Law, and on into the political arena. Politics began for Nixon in the late '40s as a headline-making congressman serving on the infamous House Committee on Un-American Activities. He was elected to the Senate after a bitter, Red-baiting 1950 campaign against California encumbent (and former film star) Helen Gahagan Douglas, and then joined Dwight D. Eisenhower on the Republican ticket in 1952. It was a distinguished, if controversial early career that was just a prologue to the main acts to follow after his election to the presidency in 1968. "He was a tough political fighter," Hopkins says. "But politics is politics. There are people just as ruthless in the movie studios in the executive offices... The bombing of Vietnam, the bombing of Cambodia -- that was a horrifying time. [On the other hand,] they say the [British] bombing of Dresden was so terrible. Well, the [earlier German] bombings of Birmingham and Coventry were too. What do you do? You're fighting a war. `It was not good to bomb Dresden.' I don't think it's good to bomb anywhere!" Living in Nixon's skin, so to speak, did not leave Hopkins feeling different about himself or the world. But, more crucially, will American audiences feel different about themselves or their nation and its relationship to Richard M. Nixon after seeing the film? "God, I have no idea," says Hopkins, but it is the moviegoer who will make the ultimate judgment on "Nixon's" Nixon: "You play [a character] as a normal human being. You play him open-faced, and the audience does the work."